The Moon and Venus offered a stunning view from Rome, a couple of nights ago, hanging above the celebrated skyline of the Eternal City, in a wonderful conjunction. We are pleased to share some of our images with you. On 17 May 2018, our Moon had a special meeting with planet Venus, the brightest object out there after the Sun and our only natural satellite. 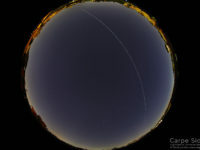 These conjunctions are regularly happening, so they are not rare at all, but their beauty is so overwhelming that each of them is a unique show. 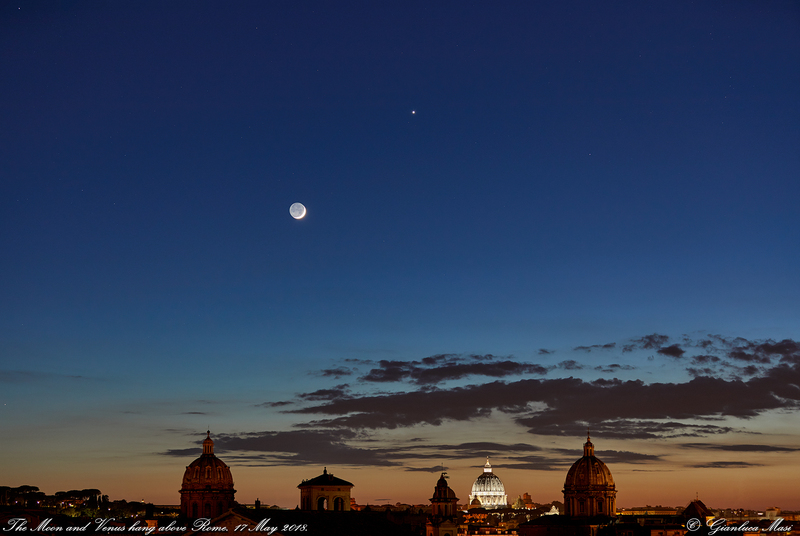 Venus, with its orbit inside that of the Earth (this is why we call it, with Mercury, an inner planet), is always visible at dusk, both at sunset and dawn, so it is easy to spot together with a sharp Moon crescent. 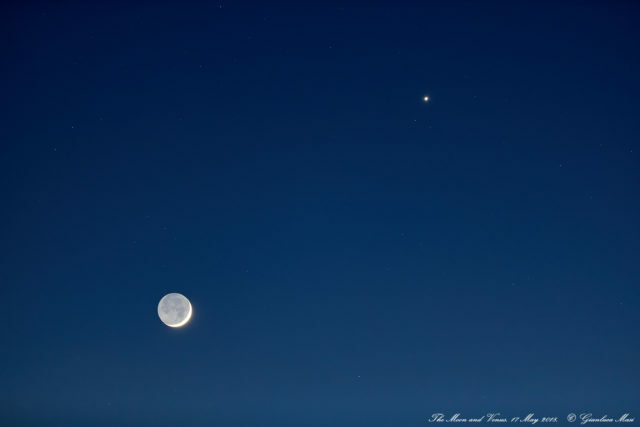 This is what happened earlier this week, at sunset: a very young Moon joined the brightest planet, offering such a wonderful sight at dusk. 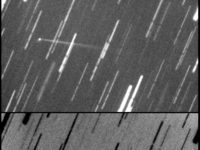 These conjunctions are wonderful opportunities to (re)discover the sky from usually unfavorable urban locations, where light pollution makes the view of the stars very difficult. Also, admiring them above the legendary skyline of a city like Rome, with its venerable monuments, is an experience by itself. 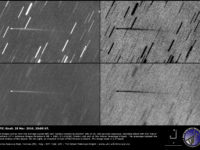 I always try to cover these events, as part of the outreach activities of the Virtual Telescope Project, as well as of my photographic investigating on the relationship between the wonders of the sky and the beauty of Earth and Art. 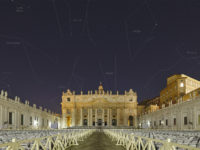 Living in Rome, I love looking around for places and monuments to include in my images of those stunning cosmic happenings. This Moon-Venus conjunction was going to happen with our satellite showing just a very small fraction of its disk enlightened by our Sun. When the Moon is very young or very old (that is, soon after or just before the new Moon), you can easily see its entire disk, even its larger, but much darker fraction, thanks to the light our planet reflects back to its cosmic companion. This is what we call “Earthshine”: if you were on the Moon while it is new, you would see on its sky a very bright, full Earth, reflecting back a lot of light, making the lunar night much brighter. How many times did you walk at night, thanks to the light of the full Moon? Here it is the effect on the Moon of the full Earth: Earthshine! I admit: I love the Earthshine. I find it so elegant and I’m never tired to image it. 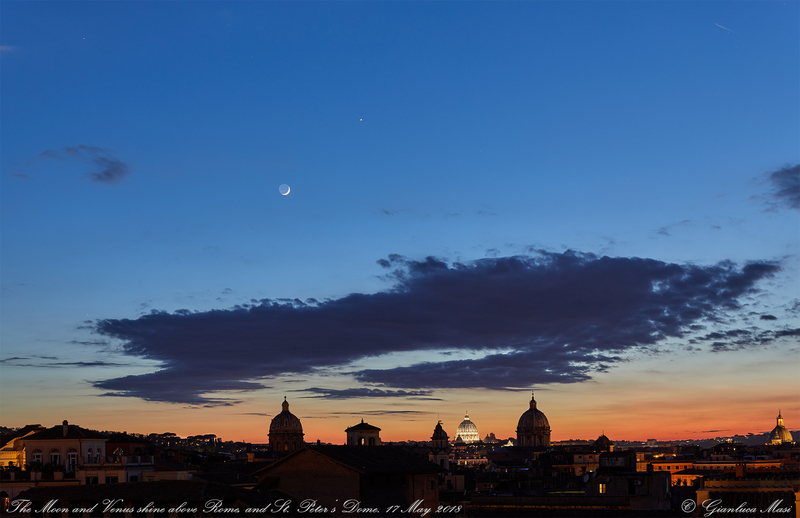 This is also why I could not miss this conjunction: I could have the bright Venus, the Moon and its Earthshine just above the stunning skyline of Rome, lost in the colors of the sunset. What else? Ah, sure: I wanted my revenge after my previous, unsuccessful attempt, last month, when the clouds said “no”. 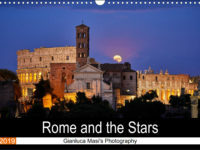 I reached my observing site close to the Capitoline Hill, offering a nice western skyline: not only I wanted to capture the event at dusk (the light I really like more for imaging the brightest celestial gems and the treasures of the city), but I planned to track the conjunction while we slowly entered the night, so being on a hill helped a lot. Needless to say, I arrived there while the Sun was still well up and shining. I learned that, even after many decades of experience, you never know what can go wrong, so it is much better to reach your site well in advance, carefully setting up your equipment, studying on the field the last-minute weather, environmental conditions and choose the best frame accordingly. And you can breath the beauty of the event much deeper, of course. 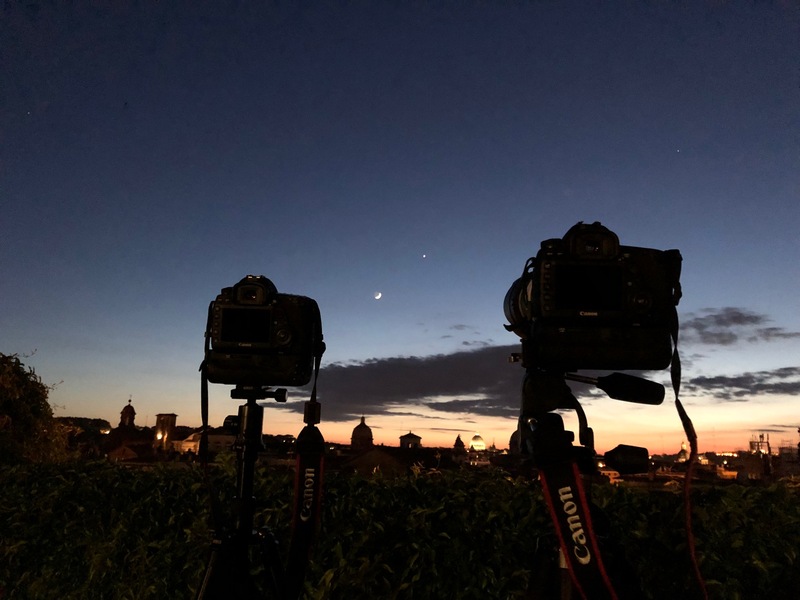 The sky was basically clear, but considering that the past few months have been always cloudy… it was better to wait for the sunset before to bet on my success! Indeed, when the Sun set, some clouds entered the western sky: Murphy is always at work, of course! But I decided to take the good from this: those gentle clouds added something to the overall experience, with magnificent hue and colors all around. So, I quickly installed both my Canon 5D Mark IV digital reflex bodies on the tripods, using two different lenses: a Canon EF 24-70mm f/2.8L II USM and Canon EF 70-200mm f/2.8L IS II USM, respectively, two of my favorite ones for this kind of photography. 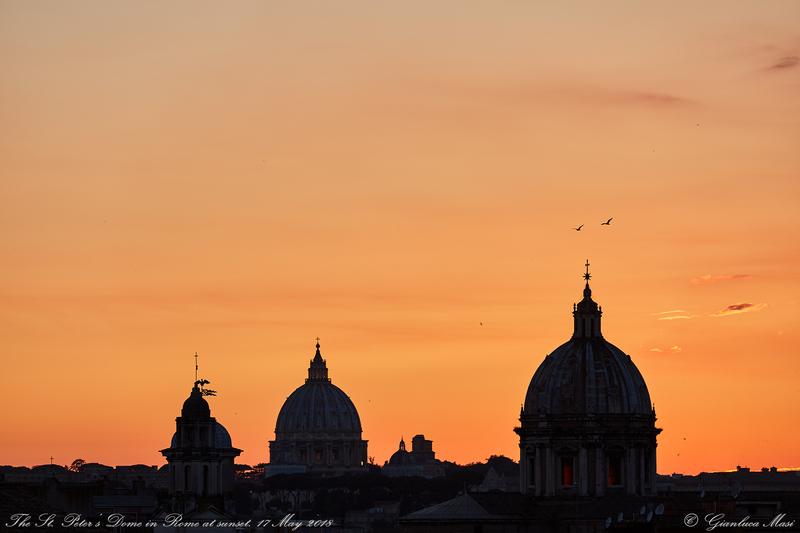 Needless to say: the sunset was magnificent, with some of the many church domes of Rome offering their silhouettes, including the most celebrated one, the St. Peter’s Dome. St. Peter’s Dome at sunset. 17 May 2018. 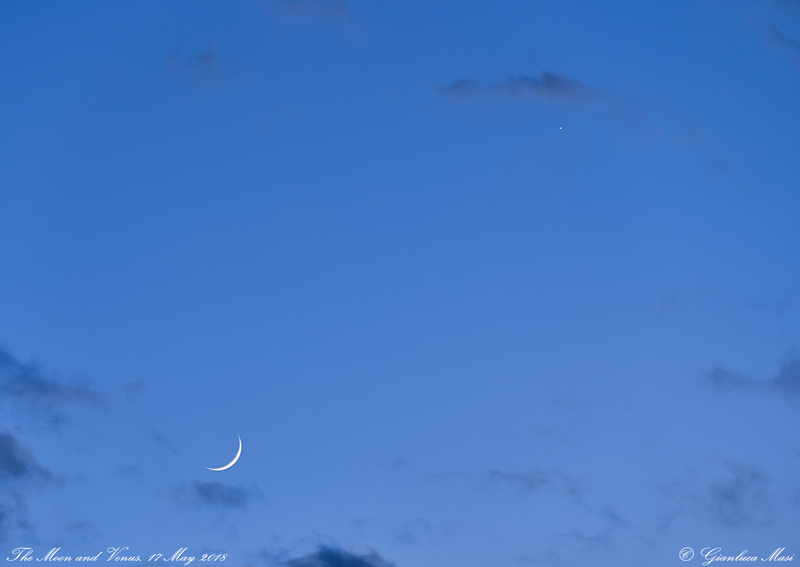 Soon after the sunset, I captured the tiny lunar crescent, with an already obvious Venus, among the clouds. The show was just starting! A huge cloud slowly moved from the North into the field of view, covering the sky between the domes and the precious Moon-Venus couple. I was actually happy for this, possibly creating more pathos. 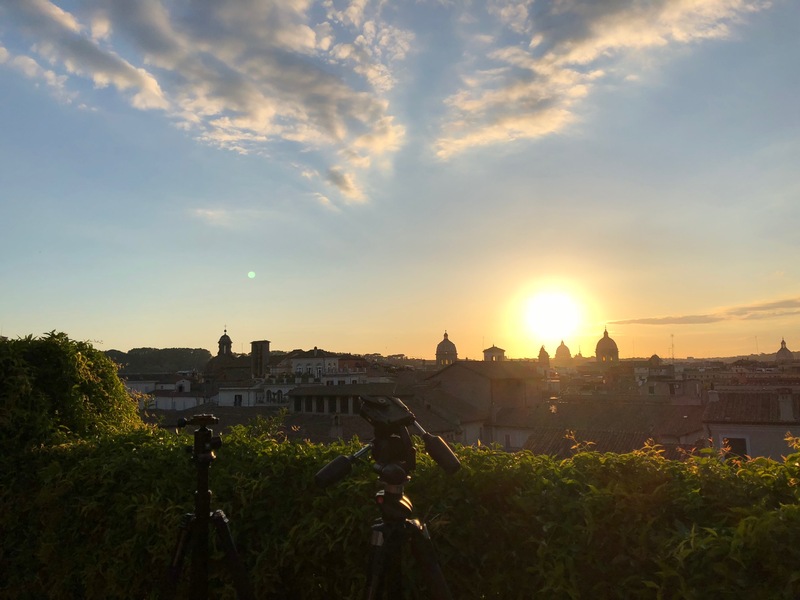 Just to give you an idea of what was happening behind the scene, here they are my cameras at work, with my two cosmic models, the clouds and the domes, with the St. Peter’s one standing out. I told you: I love the lunar Earthshine, especially when the sky background is still a bit bright and blue. Having Venus around made impossible for me to resist, so I carefully selected the best exposure to get what I wanted. Minute after minute, the sky darkened and our celestial companions slowly approached the horizon. 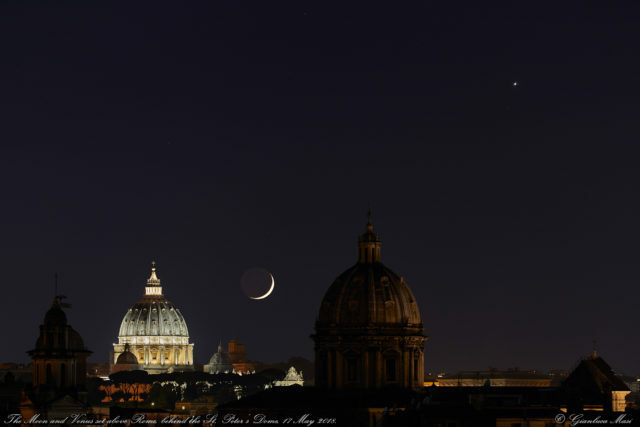 While the Moon and Venus were going to set, they framed so beautifully with the terrestrial and monumental elements. This was a view I have been waiting for to capture for quite a number of years. Then, I said goodbye to both the Moon and Venus. It was a magnificent show and I really hope these images help to bring you the sentiments and the feelings of the experience. 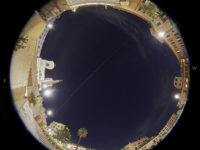 8 October 2014: Total Lunar Eclipse – live event, online!